The Dunkelberger's customer is very important to us and as a thank you for your continued support we are giving back to you! 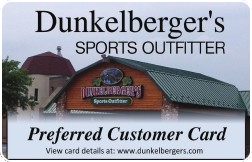 Join the Dunkelberger's Rewards Card Program today. Earn points on every single purchase you make with us! To begin earning your Rewards Card points, just fill out the member profile application, available at any of the checkout counters. The membership is FREE and you'll recieve 100 FREE points just for becoming a member! Receive card holder only savings. Get exclusive discount coupons via e-mail and a special Birthday gift on your special day!